The first Great Artist of the Italian Renaissance. 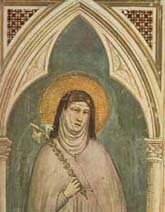 Giotto di Bondone was born in 1267 in or around Florence. His early years were spent as an apprentice to Cimabue, another great Florentine painter. He was recognised, in his own lifetime, as being a revolutionary who evolved the earlier, flat, decorative Byzantine-style into three-dimensional realism. Cimabue is said to have discovered the young artist drawing lifelike pictures of sheep on a rock. Cimabue was so impressed that he took the boy as an apprentice in his own workshop. Another legendary story is that when his master had left the workshop the young artist painted a fly on a picture that Cimabue was working on. The fly was said to be so lifelike that on his return Cimabue tried to brush it off. These two stories originate from Vasari's The Lives of the Artists (Oxford World's Classics and have become part of the artist's legend. At the age of 20 he married Ricevuta di Lapo del Pella and had many children, some say six, but eight is a possibility. Remembered as a great wit and personality, and for his ugly appearance, (there is some suggestion that he may also have been a dwarf) he is the superstar of early Renaissance painting. Giotto, a giant of Italian Renaissance History, counted Dante as a friend and he was a contemporary of Duccio (1255/60-1318/9) and of Simone Martini (1284-1344) both from Siena. His lifelike drawings astounded his contemporaries and his skill was legendary. He travelled with his master Cimabue to Rome in or around 1280, and then on to Assisi, where Cimabue had been commissioned to paint frescoes. 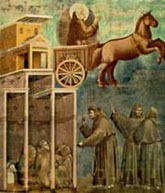 It is thought that the fresco cycle, The life of St Francis, is Giotto's work, but this is disputed by some historians because of the differences between them and the frescoes in the Arena Chapel in Padua. The Stigmata of St Francis (now in the Louvre, Paris) are among his works, as is a crucifixion in the Church of St Francis in Rimini. 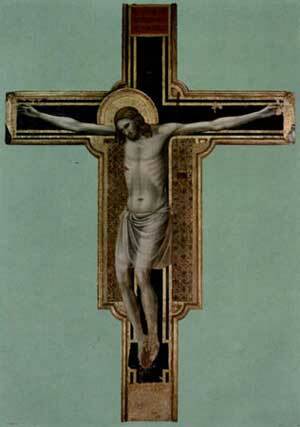 I have seen the Stigmata in the Louvre, a wonderful place to visit, allow at least a day to fully explore. Seeing this panel brought home the importance of an artist that I remember as a student (over 45 years ago). Giotto was always the starting point when studying European art and was often dismissed as a pagan by my fellow art students at the time, but when rediscovering his work, in the flesh, I found the power of his art to be truly uplifting. Cimabue Duccio and Simone Martini are important figures when their work is compared to Giotto. Click on the links to view the differences in painting styles of these artists. The church of Santa Maria Novella in Florence is home to some of the early work. There are a huge Crucifix and a Fresco of the Annunciation, these date from about 1290. The decoration of The Scrovegni Chapel was the artist's great work in Padua. Between 1303 and 1310 Giotto produced a series of frescoes in a Chapel built by the wealthy banker Enrico Scrovegni. Sometimes known as the Arena Chapel the works include paintings of the Angel Gabriel and of the Virgin Mary. These paintings are regarded as the great masterpieces of the early Renaissance. From 1306 to 1311 he painted frescoes in Assisi using stories from the Golden Legend, a medieval bestseller by Jacobus de Voragine, as his inspiration. In 1319 he painted four chapels in the church of Santa Croce in Florence the most notable are his works in the Bardi Chapel and the Peruzzi Chapel. The Peruzzi Chapel frescoes were studied by many Renaissance artists, including Michelangelo. 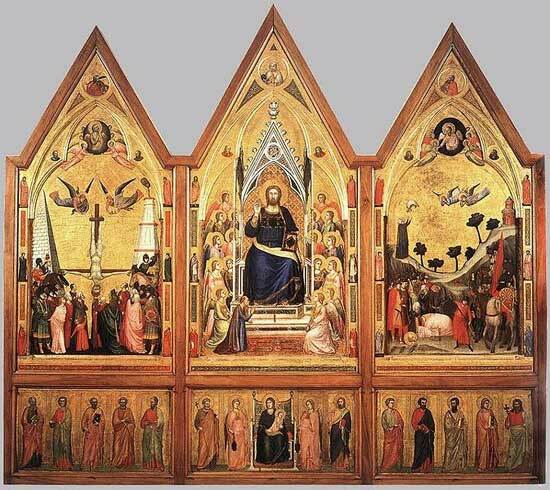 The Stefaneschi Polyptych was completed in 1320 and is now in the Vatican museum in Rome. He travelled to Rome staying for six years and in 1328 he was in Naples where he remained until 1333. 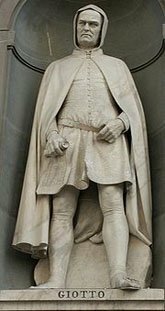 The Campanile of Florence Cathedral (bell tower) was designed when he was appointed a the chief architect to the city in 1334 and the Campanile still bears his name. Giotto died in 1337 and was buried in Florence Cathedral, and his work has become the very starting point For Renaissance art.